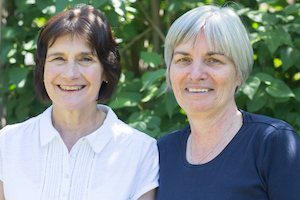 Mary Atkinson (left) and Sandra Hooper (right) are co-founders of the Story Massage Programme. They are both massage therapists with a mission to share the benefits of positive and respectful touch with children and adults of all ages and abilities. It is the combination of their interests, experience and talents that has made the Story Massage Programme so successful. Mary Atkinson is an award-winning complementary therapist and author of four books on massage including Healing Touch for Children (Gaia, 2009). She regularly talks at conferences and writes articles for national magazines on the power of positive touch for children. In April 2012, Mary worked with Cocoro Charity to introduce Story Massage to the children, parents and teachers living in the aftermath of the tsunami in Japan. This proved so effective and popular that Mary and Sandra decided to launch the programme internationally. Sandra Hooper is an experienced primary school teacher and massage therapist, combining both of these skills in her work with the Massage in Schools Programme. Sandra has worked with teachers and health professionals both in the UK and abroad, at school and in the home, to bring the benefits of safe and positive touch to children of all ages. Sandra has also worked successfully with national parenting programmes whose main goal is to increase the knowledge, skills and confidence of parents. 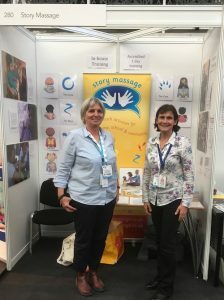 Mary and Sandra first started collaborating on the idea of bringing story and massage together as a fun and inclusive therapeutic activity in 2007. With the help of parents and professionals including therapists, teachers and social workers, they developed the Story Massage Programme of ten strokes. Their book Once Upon a Touch… Story Massage for Children was first published in 2013 and at the same time they began running accredited day courses at different venues around the UK. Over the past five years, they have trained over 1,500 people from many different backgrounds to use Story Massage within their work and/or home, and have distributed books and resources to nearly every corner of the globe.